From the moment he was arrested for trespassing at a McDonald's in Ferguson, Missouri, on August 13, 2014, Washington Post reporter Wesley Lowery found himself in a unique position from which to cover police brutality in America and the burgeoning Black Lives Matter movement. In They Can't Kill Us All, Lowery goes behind the barricades of #blacklivesmatter -- telling the story of the young men and women who are calling for a new America. After hundreds of interviews with victims' families, local activists, and officials conducted over a year of on-the-ground reporting, Wesley Lowery has brought a new understanding of life inside America's most heavily policed cities. Drawing on his own experience growing up biracial in suburban Cleveland, Lowery probes killings that have shaken America to the core: Trayvon Martin in Florida, Michael Brown in Ferguson, Tamir Rice in Cleveland, Walter Scott in North Charleston, and Freddie Gray in Baltimore. Grappling with decades of racially biased policing in segregated neighborhoods with failing schools, crumbling infrastructure, too few jobs, and threadbare community services, Lowery examines how these factors have all contributed to our national crisis. 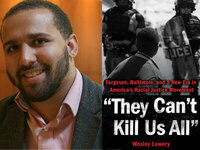 Wesley Lowery is a national reporter for the Washington Post who covers law enforcement and justice. He was a member of the team awarded the 2016 Pulitzer Prize for National Reporting for coversage of police shootings. DeRay Mckesson, an activist, educator, leader in the Black Lives Matter movement, and interim Chief Human Capital Officer for Baltimore City Public Schools, will introduce the program.